On a clean surface, spread out one single 18- x 12-inch (46 x 30 cm) piece of plastic wrap. In the centre of the plastic, overlap 8 to 12 individual slices of smoked salmon, to form a rectangle approx. 12 x 8 inches (30 x 20 cm). Mix any leftover salmon + cream cheese + mustard + green onions into a food processor. Purée (a few pulses will do) until smooth, and spread an even layer of the smoked salmon slices. (If no equipment, mash well, and stir vigorously). Leave approx. 1 inch (2.5 cm) of the end of the rectangle uncovered. 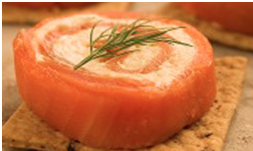 Starting at the long covered edge, roll the smoked salmon into a tight log. Pick up the plastic wrap and use it to encourage the salmon to roll tightly. The uncovered edge of salmon at the end will help form a tight seal. Pinch the plastic wrap on both ends and then roll the log until it tightens and forms a cylinder. Refrigerate for 2 hours to firm up. When the roll is firm enough to cut, slice it into even rounds – approx. ½”. Place each round on a slice of baguette/cracker, then top with a pinch of dill, and serve.